The Apple MacBook Air SuperDrive is the perfect complement for the new, sleek MacBook Air. You can read and write CDs and DVDs, and it is perfect for watching a DVD movie, installing software, backing up your data, and more. The new Apple MacBook Air is thin and beautiful, and is able to do tricks such as borrow the optical drive of another computer on a network. But sometimes you need an optical drive on the go, and that's where the Apple MacBook Air SuperDrive comes in. Made by Apple with a design to complement the MacBook Air perfectly, the MacBook Air SuperDrive connects to your MacBook Air with a built-in USB cable you'll never lose. No extra power adapters are needed, as the SuperDrive simply draws power from the USB connection itself, regardless of whether or not your MacBook Air is plugged in. The SuperDrive features speedy performance, writing DVD+R DL and DVD-R DL discs at up to 4x speed, and DVD-R, DVD+R, DVD-RW, and DVD+RW discs at up to 8x speed. 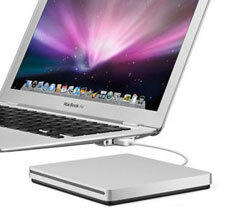 The MacBook Air SuperDrive employs a slot-loading design that makes it miniscule--barely larger than a CD case. You can easily drop the MacBook Air SuperDrive into your bag and take it everywhere you go. Now you can enjoy a DVD movie while on the plane or you can burn onto a CD that song you've been working on while you were on the tour bus. MacBook Air SuperDrive with attached USB cable, user's guide.